Thank you for your nice tips & tricks! I already installed CWM and would like to replace it by TWRP but it does not work. Every time it reboots under recovery, CMW remains the recovery mode used. I even tried to reinstall the original recovery with Mobileuncle, without succes :(. Would you have an idea how to replace CWM by TWRP then? Hello, what's your device ? And will be working ! Porfavor quiero instalar cwm recovery en alcatel one touch idol 6030a ayuda por favor mil gracias. I don't know Spanish but I was using google translate and I found you want to install CWM Recvery on your Alcatel 6030a just follow instructions above. Please post comment in English! I hope you have new CWM file for my phone! Thanks a lot! I don't know because I haven't device.You can try there is nothing dangerous for your phone and tell me if it works. im the guy with the 6030a. it works. i used the 6030d method. with the CWM recovery. Hello is any way to install TWRP recovery via stock recovery or ADB or mtk droid tools in one touch 6030x ? I changed some lines in build.prop and after reboot it stopped on orange logo. phone is rooted. I have copy of build.prop in the same folder on phone. ONE TOUCH UPGRADE telling me there is no grater software for my alcatel. I need to install TWRP because i cant run aroma file manager in stock recovery. sorry for English. DOWNLOAD THE TRP RECOVERY IMAGE AND FLASH IT USING THE SP-FLASHTOOL. I have problem with connecting phone and using mtk droid tool to create scatter file. When I connecting turned off phone (MTK droid tools working) i hear windows "connected" sound and after 3-4 seconds it unplugging itself and phone displays fully charged battery. I haven't that problem when i using ONE TOUCH UPGRADE S it looks like One touch upgrade program preventing to self disconnecting of the phone. Sorry for my english. Ok. I installed your TWRP and new ROM from someone's TWRP backup. The problem was with error 10 code ("This device cannot start.") in Device Manager. I just downloaded the "MT6577_Android_scatter_emmc_PMT" scatter file from one of tutorials in internet. When choose TWRP and check only RECOVERY in Flash Tool, I plugged phone to USB and heard "plugged device sound" I quickly click "Download" and "Yes" it started flashing recovery. Past 2 seconds it disconnected itself (as it used to do) so I plug out and plug in again phone and Flash Tool finished flashing (green circle "Download OK"). It works. Sorry for english. Can you do Alcatel Scribe Easy OT-8000? I have an Orange San Remo (Alcatel OT 6030x) and I installed on it one TWRP with Mobileuncle but when I restart into recovery (ON|OFF Button + Volume UP) there is no more recovery now (neither the original nor TWRP). What should I do? Thanks! It worked! I followed your advice and changed the name of the original file into recovery.img. any of the two as long as it is stable. Any luck with the scribe OT-8000A? can you give me original stock recovery ? Actually, I'm not sure if this phone has any recovery at all... I mean, when you hold VOL UP + PWR, it tells you that all data will be erased, blah blah blah in 5 different languages. There's a green check mark and a red X below. You'll have to long-press the green if you want proceed and the X if you want to quit. If you press the check mark, it will just restore factory settings. That's it. I'll try. but FYI, I'm on stock rom (4.1.2 build JZO54K). Hi, I have an Orange alcatel one touch star 6010x and I can't install any CWM or TWRP recovery (it freeze when I push ON|OFF Button + Volume UP)! Is your phone rooted ? if is rooted install mobile uncle tools and flash recovery. Thank you so much for help me ! Else, what can I do ? It freeze also when I try to install the original recovery ! So, I can't install any recovery ? Look rename long name of recovery to recovery.img only. It doesn't work with the original, the TWRP or the CWM recovery with just recovery.img for the name. What can I do because I want to install the laucher of your article ! tnx for all.. but i hawe one question...im using alcatel ot idol 6030x..make root with framaroot and install twrp..yesterday i recived official update and i canot install it...when i try to install update.zip in twrp say that update.zip error...did you hawe some solution?my firmware is 1004F.. I don't know why doesn't work on your phone. If you want give your original recovery I will port another recovery for you!!! Hello, official update check what you deleted, changed if you're delete some apps in ROM you need to revert to factory ROM if you have backup of your ROM restore it and restore stock recovery then install update. Yes please ! But how ? but problem is i make a backup of ROM in that way..clean rom(erased google+)...my bad..
but ok now i know that this is a problem why i canot install update...my phone works nice and i think that i gona wait for CUSTOM ROM ...tnx one more time!!!!!.. This is not good, but If you want I will give you backup of ROM for 6030X. As you know Alcatel has MediaTek CPU and not usual partition custpack like on most Androids this is one of bad problem for porting or developing custom ROM. I hope soon we to have CyanogenMod!!! Hey.. Why you think that this is not good? And yes if you can sand me your backup.. Tnx allot!... Your backup is fully stock or? One more time TNX for all man! Please help me and thank you again for your help ! I uploaded Sp flash backup I think backup is already rooted but you can unroot easily. can you upload a stock backup for the 6030a? Is it working on Alcatel Scribe HD (8008X) ? Thanks . No you need to give me your backup. Ok your phone is still working ? Hi kubo...is there some mode or something to make LED more brightnest (power of light) because in dark i badly see my LED notification! And yes your backup works.. Tnx alot one more time! Low led ha.. Bad! :-(... Today i make with gravity box that my backlight of keys blink when some notification ariwed... And works... Happy.. :-).. Its batter then led ligt..
Is there any way to do that ? Same specs ... only screen different, but same resolutions. To be honest is a Orange San Remo = 6030X Alcatel One Touch Idol ... from romanian provider - ORANGE RO. Wooow... I hawe.. :finger crossed for this.. Because i read a lot of post on xda and i think this port of rom 4.1.2 gona work on oure device... Kubo! What you think? Hello, I think there is no difference between our JB just another launcher and some modifications on framework-res.apk & systemUI-res.apk!!! But I'm working on porting some ROM like Lewa, MIUI or other to our STAR, IDOL etc. hey can i ask ? .. what that hint that i have already twrp? Hi!! I have a 6010x and i tried the metod with mobile uncle and twrp recovery but the original recovery is erased and nothing flashed. Whats your opinion?? Hello, i tried your method but everytime i press 'recovery update' i get a list of 25 files in an online directory i think called 'remote' but i cannot find the downloaded twrp recovery. Is there perhaps a setting i didn't check? hello to admins and well done for good job and keep up the good work to save us from our hell! i whould like to ask whats the differece between Star 6010x and 6010d, and as i saw you have the same file for both phones for TWRP and CWM is there any issue? i have the star 6010d can i use the file of TWRP with the name of 6010x? Hi is there any cwm or twrp for the Alcatel one touch evolve 5020t? Can i install TWRP or CWM on Alcatel one touch 7025D Snap? what custom rom for my phone is compatible? becouse my phone stuck in logo ..
hello KUBO ..i have problem with my phone one touch star 6010D ..
my phone allways stuck in logo.. maybe i must flashing but i don't have firmware ..
do you can help me please ..?? where is my phone alcatel idol 2 mini 6016x? Alcatel OT-6012D how to install all the application that has been flashed? PLEEEEAAAASSSEEEE port a TWRP or a CWM for POP C7 7040D!!! I cannot find one anywhere on the internet. Easy. Brick it for real! Use ADB to flash say a recovery image to the system partition. Hahaha. Now it's really bricked and you will not get that message about the latest "firmware". LOL. Your Mobile Upgrade software will now flash. how to twrp/cwm recovery on alcatel ot pop D5 5038X? Hello ive got a question. I want to download the custon recovery for my Alcatel One Touch Idol. 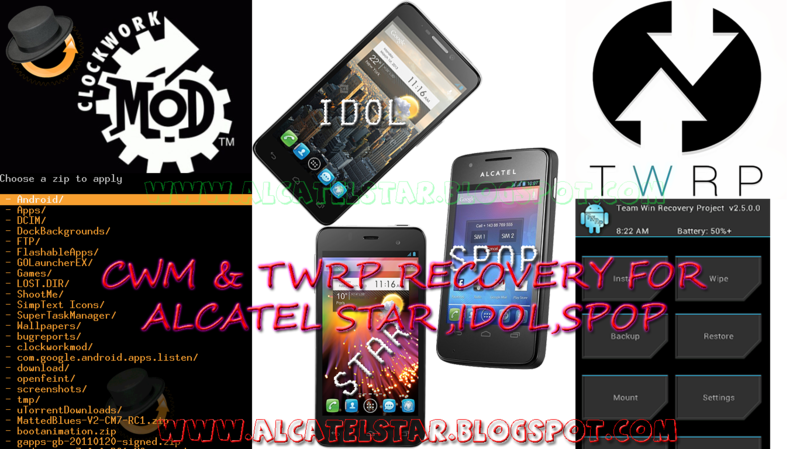 But if i dowload it i will always get a file named "TWRP2.4_Alcatel_STAR_6010X_[alcatelstarblogspot].img". I think this is not made for the Alcatel one touch Idol. Pleas help me and upload the right one. How to cwm/twrp Alcatel ot pop d5 5038X? I want to ask you, how to install custom room for my alcatel one touch pixi 8. (Tablet not 3g). My tablet has root permission. hi, can i change my stock recovery to CWM? my device is Alcatel One Touch Scribe HD.